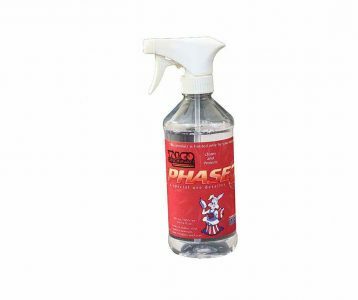 Phase2™ is a heavy-duty detailer designed not to just replace conventional detailers, but to go a step beyond to remove oil, grease and other foreign substances. Ideal for tough, hard-to-remove applications, Phase2's uses are limited only by your imagination. It cleans and protects rubber, vinyl, anodized aluminum, paint, fiberglass, lexan and more. Applications include but are not limited to wheel/fender wells, radiator hoses, valve covers, motorcycle seats (won't leave them slick), engine components, suspension components, tools, tool boxes, tonneau covers, hubcaps, frames, firewalls, air cleaners, molding, vinyl tops, tires (doesn't “yellow” white walls or lettering), underside of hoods, and lawn and garden equipment. Phase2 is especially effective at removing brake dust from wheels. It also cleans oil and grime off of shop and trailer floors. For racers, Phase2 easily removes oil blow-by (even synthetic) from painted surfaces and windshields. Use Magic Mix Phase2™ to clean your engine compartment! Open hood, wet down everything with Phase2, close hood, let vehicle idle 5 to 10 minutes. Open hood and hose with high-pressure water hose. After rinsing, mist lightly again with Phase2. Your engine will look like new. Phase 2 will be added to Cart!